Removed child and later the first indigenous Socceroo John Moriarty (at right) was reunited with his mother in Alice Springs in the early 1950s after more than a decade long search. As a young boy John was spending his Christmas holidays in Alice Springs having come from Adelaide. John had been taken from the Roper River Mission in 1942 by the government and ended up at St Francis’ House in Adelaide in 1949, a home for Aboriginal children. For years John had been searching for his mother, Kathleen. His memories of being with her at Borroloola and Roper River Mission stayed with him as indeed did the traumatic moment when he was taken while at school. John recalls: “My mother took me to the Roper River Mission School, 300 kilometres from Borroloola, rather than risk losing me. 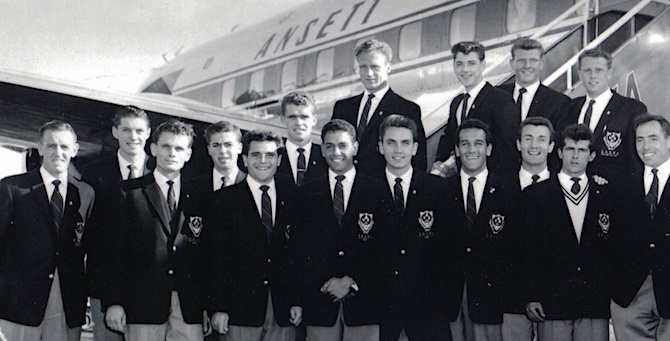 1960 SA State Soccer Team. John Moriarty in centre of the front row, Charlie Perkins is fourth from the right. “After a few days at school I can remember getting on an army truck. There were other children and mothers in the truck including Jim and Rose Foster, Wally McArthur, Wilfred Huddleston, Alice Roberts and her son Glen and daughter Janice, Marie Burke and daughters Laurel and Wendy and others. “The truck went all the way down to Alice Springs. We were placed at the Bungalow. Then we were at the railway track, all bare footed and with limited clothing. John was only four years old. This was the beginning of the assimilation programme for Aboriginal people, which was the policy of the Federal Government. John spent eight years at Mulgoa including several months at Mt Wilson where he enjoyed school and learned how to supplement his meagre diet by hunting in the paddocks around the home with other children. “We caught rabbits, goannas, turtles, bush tucker, berries and some types of birds,” recalls John. Nevertheless, he remembers he was always hungry. 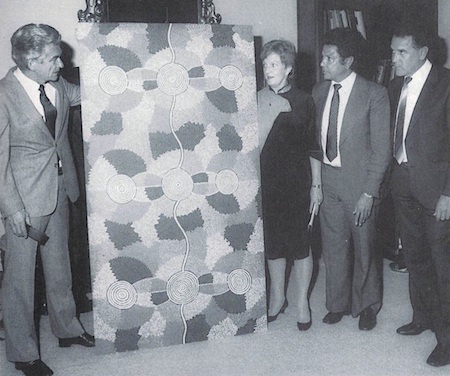 AT LEFT: 1983 – John Moriarty and Charlie Perkins present artwork to Prime Minister Bob Hawke and his wife Hazel at The Lodge in Canberra. “I was often so hungry at Mulgoa that I would volunteer for cooking and washing up duties so I could sneak extra food or whatever was being cooked. Thanks to these Aboriginal women John was able to maintain a connection with his cultural heritage. At the end of the war the church moved children on from Mulgoa in line with the government’s assimilation policy, as Mulgoa was only intended to be a temporary residence. When it was time to leave John was naturally very sad to leave his school mates behind. During the war years John’s mother became aware that he was at Mulgoa and sent him a specially hand crafted pandanus basket which John treasured. It was the only connection he had with his mother. That basket is now safely housed at the National Museum of Australia in Canberra along with other personal items including a soccer trophy, three state blazers, scrapbooks and a woollen dressing gown presented to him at St Francis House by Father Percy Smith. Fast forward to 1953 in Alice Springs. John was walking with Wilfred Huddleston in the intense heat outside the Stuart Arms Hotel. He happened to look across the street where an Aboriginal woman was staring at him. John was transfixed. A moment passed and she came across the street. She said: “I’m your mother.” They were again united. The emotions surging through mother and son were overwhelming. AT RIGHT: 1949 – John Moriarty, right and Richie Bray at St Francis’ House (Glanville Hall) in Adelaide. Kathleen O’Keefe had instantly recognised her son after so many years. They sat on the kerbside and talked about family. John recalled the reunion in Saltwater Fella, his autobiography: “When we sat down she touched me, but not for long. She just touched my hand. A very brief touch. I’m sure she got what she wanted out of that very brief touch. “My mother was slim, fine-boned, very graceful with her movements. She had a lot of grace. We kept talking, then we moved to St John’s Hostel, where Boofa (Wilfred Huddlestone) and I were staying, and we sat there talking some more. Then she had to go back to The Bungalow. The boys always were a constant support to one another. Wilfred Huddleston was there again at the emotional moment of the reunion, as he was alongside John in the army truck that took them away more than 10 years earlier. 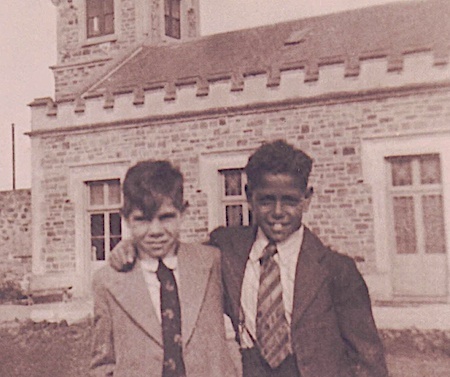 At St Francis House in the late 1940s and 1950s John had the opportunity to go to school, to grow up with other Aboriginal boys and to develop his natural sporting skills. He attended Le Fevre Boys Technical High School in the Port Adelaide district at a time when almost no Aboriginal children attended a secondary school anywhere in Australia. An opportunity came his way to play soccer. 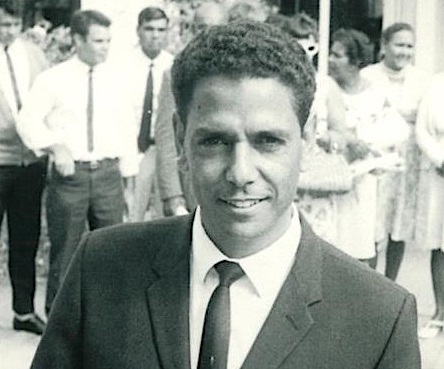 In 1961 John was the first Indigenous Australian to be selected for the national soccer team. Later he travelled overseas gaining much life experience. He represented the state of South Australia seventeen times. John’s achievements later earned him the position of National Indigenous Patron of the Football Federation of Australia. From there John became interested in advancing Aboriginal issues and he played an important role in the 1967 Referendum, along with people like Gordon Bryant (first Minister for Aboriginal Affairs in the Whitlam Government), Charlie Perkins and many others including Faith Bandler. Resulting from that he saw a need to further his own education. John matriculated with help from June Taylor at Saltash College in Adelaide. Matriculation allowed him to enter Flinders University in 1966. He graduated with a BA degree. He was the first South Australian Aboriginal university graduate. John joined the Department of Aboriginal Affairs in Canberra working under the Whitlam Government and minister Gordon Bryant. In the 1980s John was appointed Director of the Office of Aboriginal Affairs for the South Australian Government by Premier John Bannon. He helped steer South Australia to having the most advanced land rights legislation in the country along with Aboriginal heritage legislation and big advances in Aboriginal education, health and welfare. He was also a prime mover in the establishment of the Tandanya Aboriginal Cultural Institute in Adelaide. In 1982 he married Ros Langham and from there they developed their highly successful design business, Balarinji, with their artwork being painted on five Qantas aircraft since 1994. AT LEFT: Qantas-Balarinji Dreamliner lands in Alice Springs in March 2018. 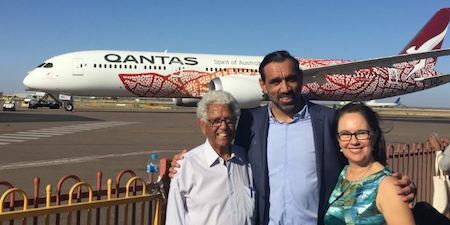 John and Ros Moriarty, with two-time Brownlow Medallist and Sydney Swans AFL Premiership player Adam Goodes. A Qantas-Balarinji art aircraft typically takes two years from concept to launch. Over that time Ros, as director of Balarinji, worked with Qantas Engineering, Boeing and Boeing’s design agency in the Boeing paint facility in Seattle, USA. Balarinji deconstructs an original painting and reforms it as a design that works around a fuselage. John and Ros moved their business from Adelaide to Sydney and took their employees with them. John became a national figure in Indigenous affairs, sport and business. He became a role model. He is sought after for advice and participation in many spheres at a national and international level. In recognition of his achievements he has received honorary PhDs from the University of South Australia and Flinders University. He has been made a Member of the Order of Australia (AM). Very recently he and his wife Ros were honoured in London by FIFA (the International Football body) for their work in developing programmes that support diversity and equality. Since 2012 John Moriarty Football (JMF) has delivered a football and education programme to more than 100 children in the remote Northern Territory communities of Borroloola and Robinson River. The program received $4.5m in September 2018 from the Federal Government to expand to 12 new sites across New South Wales and Queensland over the next three years. Star JMF graduate Shay Evans made her W-League debut for Sydney FC in January 2019 in a 3-0 win over Western Sydney Wanderers. The 17-year old from the Yanyuwa tribe in Borroloola has her sights set on playing for Australia and earned selection in the Young Matildas squad earlier this year. John continues to be drawn back to Alice Springs. He was here in March 2018 to meet the new Qantas Boeing 787-9 Dreamliner aircraft, fresh from the Boeing paint facility in Seattle. It flew direct to Alice Springs from Seattle. The aircraft has more than five thousand individually unique dots applied by the Balarinji design team based on artwork by Aboriginal artist Emily Kame Kngwarreye, an Anmatyerre elder from the remote desert area of Utopia, 230 kilometres north-east of Alice Springs. This impressive aircraft then flew on to Perth from where it made the inaugural QF9 flight direct to London. John’s spiritual home is Borroloola yet Alice Springs is a pivotal place in his life experience. Mark J Smith is the grandson of Father Percy Smith (1903-82) who was the first resident Anglican priest based in Alice Springs from 1933 and with his wife Isabel founded St Francis’ House, a home for Aboriginal children. An emotional reunion and fascinating life story for John Moriarty. This is such a great series of articles. I am very much enjoying them. Thanks Erwin. John is a great Australian. A gentle and kind man. He continues to do fantastic and important work to support young people in rural communities to enjoy the benefits of sport and access to education. Brilliant story, Mark. Keep writing because you are an inspiration to us all. My great respect to Father Percy Smith, an honourable man. What a great story about a truly great Aboriginal Australian. After suffering separation from his mother John Moriarty did not give up. John’s wife Ros obviously has played a significant role in his life. This article deserves to be very widely read.